Last summer we partnered with Sail Magazine to produce a series of short videos showing how to repair an older J22 I had arranged to be brought into the Tech shop. The boat, named Hog Tide, needed the types of repairs we wanted to cover. 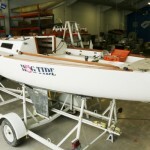 The videos can be found at both westsystem.com and sailmagazine.com. If you’re wondering about the name, all the J22s that race in East Tawas, Michigan out of the Tawas Bay Yacht Club have ‘pig’ names—Pork Bellies, Pigs in Space, Pygmalion, Evil Dr. Porkchop, The Other White Meat, and my favorite, Notorious P.I.G., are notables. This article features still pictures taken while the videos were being shot. I’ll comment as we walk through the process. The bulkhead we were replacing had a lot of checked and rotten areas around each chain plate. There was rot just about everywhere except for the trim piece, which we removed and saved to re-install on the new bulkhead. 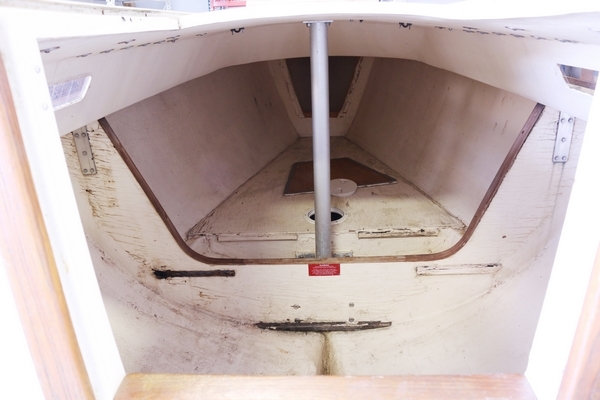 The bulkhead we were replacing, looking from the companionway towards the bow. 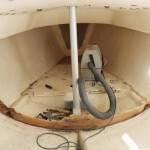 To remove the bulkhead intact, I used a vibrating side cutter with a diamond grit blade. 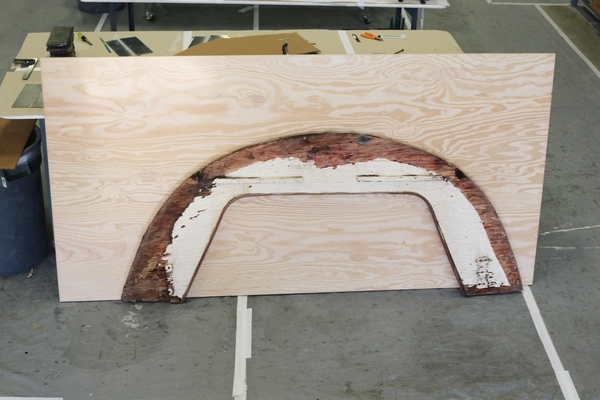 This allowed the bulkhead to be removed full size so we could trace the shape for the new bulkhead. 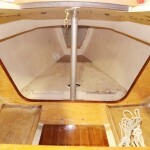 The back-side tabbing was left in place to make the alignment process a no-brainer when we installed the new bulkhead. The bulkhead has been removed and the tabbing that was on the back side was left in place. The intact bulkhead that was removed. Had the bulkhead not come out so cleanly, we would have needed to make a template from scratch for the bulkhead. 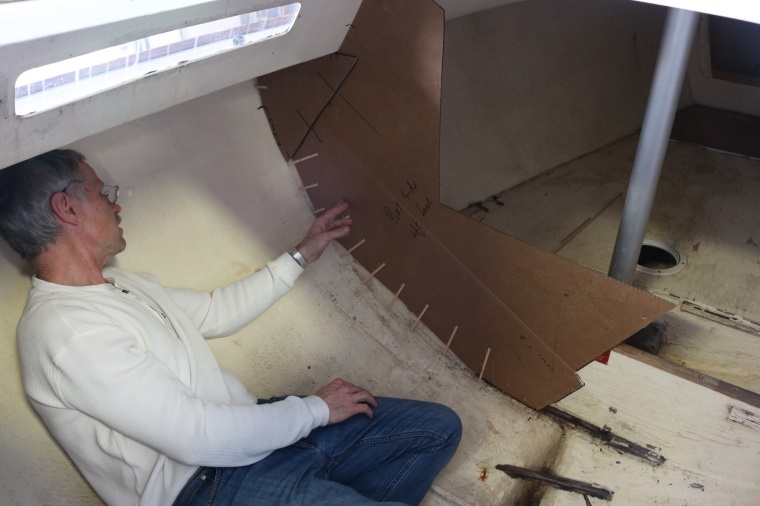 Tom demonstrates how to make an accurate template by fitting some cardboard loosely then stapling small wooden strips extending to meet the hull of the boat to define the exact shape needed. 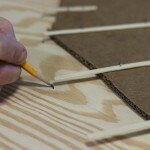 Tom laid out the template and made tick marks at the end of the wooden sticks on the sheet of marine grade plywood. Then, using a flexible batten, it was simply a game of connect the dots to define the shape of the bulkhead. 9. 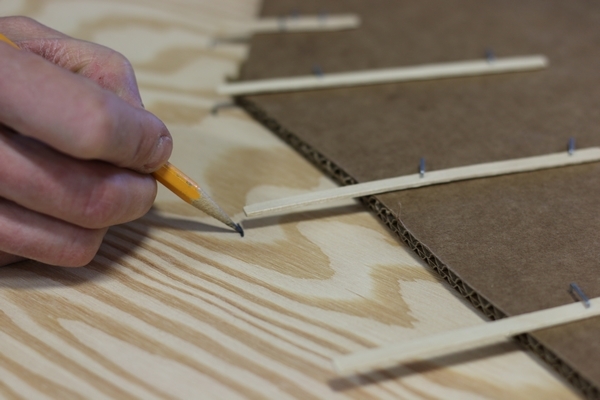 Had the bulkhead not come out so cleanly, Tom demonstrates how to make an accurate template by fitting some cardboard loosely then stapling small wooden strips to define the exact shape needed. 10. 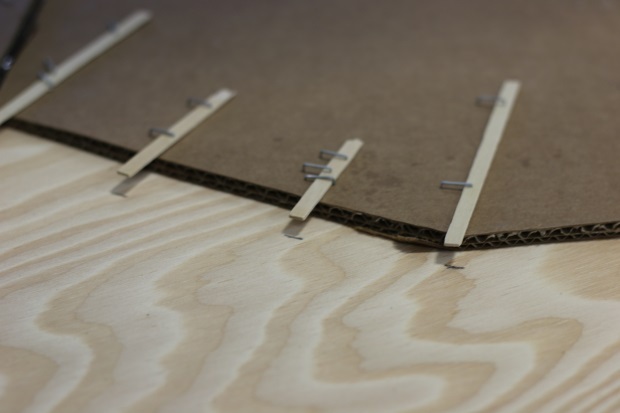 Tom has laid out the template and made tic marks at the end of the wooden sticks, then it is simply a game of connect the dots to define the shape of the bulkhead. Once our new bulkhead was cut out, it was ready for 6 oz. 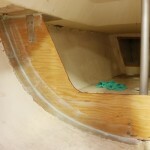 fiberglass to be laminated to both sides. 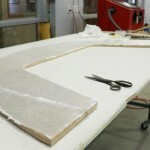 After curing overnight, all surfaces that would receive epoxy were prepped using an abrasive pad so as to not damage the fibers of the fiberglass, but still scuff up between the weave of the fabric. 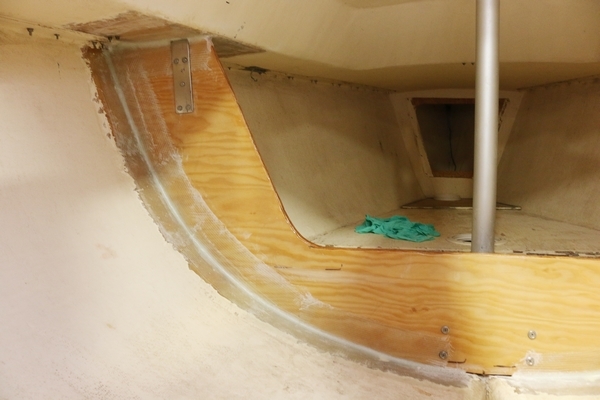 To install the new bulkhead, I precut enough 727-4 Biaxial 4″ tape for the tabbing then shanghaied Tom to be my “ground crew” while I worked inside the boat. The new bulkhead cut out and ready for 6 oz. 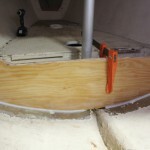 fiberglass to be laminated to both sides. 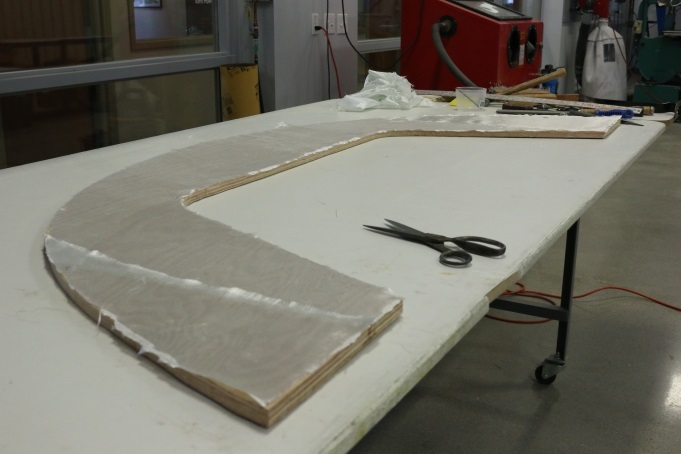 Once the new bulkhead was glassed on both sides and cured overnight, all surfaces that would receive epoxy were prepped using an abrasive pad so as to not damage the fibers but still get into the weave of the fabric. 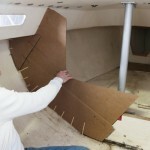 To install the new part, first I precut enough 727 – 4” biaxial tape for the job then shanghaied Tom to be my “ground crew” while I worked inside the boat. 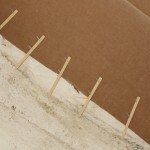 Tom supplied me with 105 Resin/206 Slow Hardener filled to a non-sag consistency with 403 Microfiber filler. We chose to use the 403 because it thickens fast without much airborne dust while mixing. The resulting graininess of the fillet would be glassed over anyway, so cosmetics were not an issue. 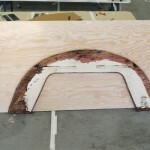 We applied thickened epoxy to the flange (original tabbing) we’d left intact, then clamped the bulkhead to the flange drawing it into perfect position. 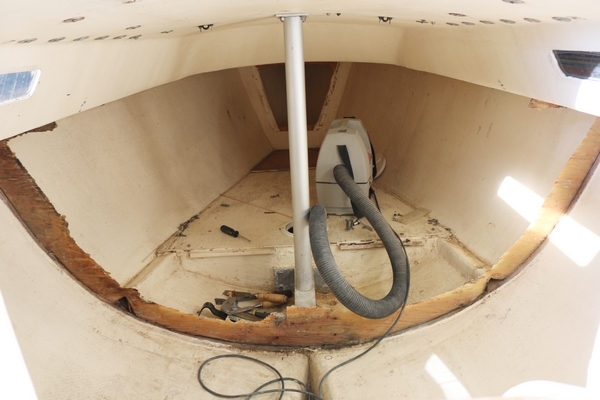 This allowed me to apply a fillet to the perimeter of the part—with the exception of the limber hole along the centerline—water still needs to flow into the bilge from the bow area. 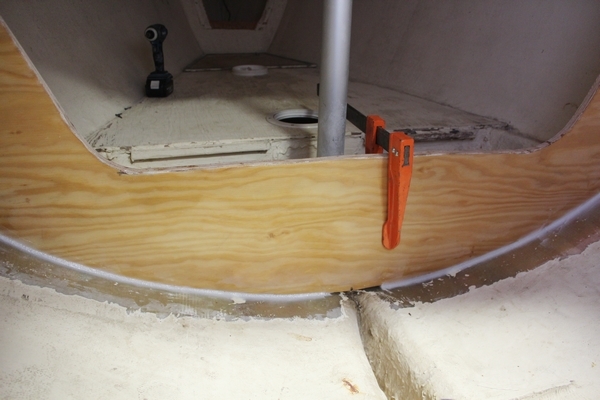 The new bulkhead clamped to the tabbing from the old bulkhead to hold it in place, and the new fillet applied. Once the fillets got a bit tacky, the 727 glass tape tabbing was installed—again using 105/206. Note that we used several shorter lengths of glass tape to make the curve and overlapped them a bit. This kept the glass from buckling around the curve and eliminated the need to cut pleats in the glass. The new fiberglass tabbing applied. 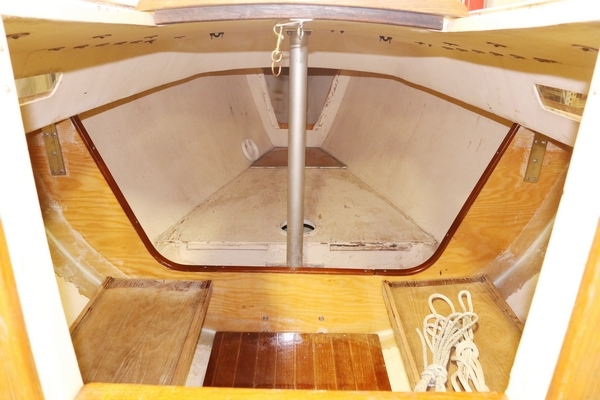 The cabin of the J22 fully reassembled. 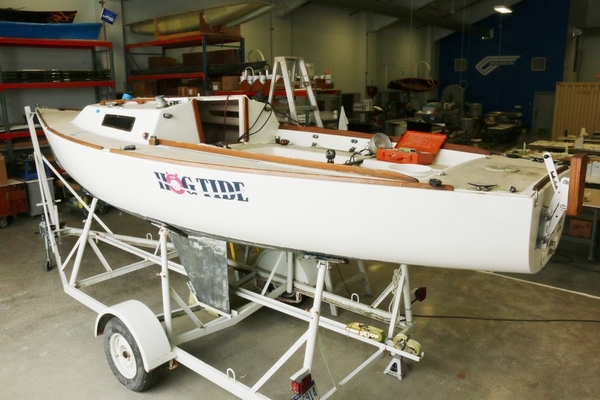 Shortly after we’d completed the transom replacement (along with some other repairs) Hog Tide was returned to her owner and took first place out of eight J/22s racing on Lake Huron’s Tawas Bay just a few weeks later. J22 Hog Tide at the Gougeon Brothers shop, getting a new bulkhead. Tom double checking the fit of his template. 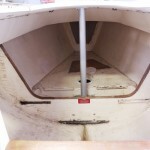 This entry was posted in Fiberglass Boat Repair and tagged #42, Bruce Niederer, bulkhead replacement, Epoxyworks #42, Hogtide, J22, Spring 2016, Tom Pawlak on February 22, 2016 by ewadmin.